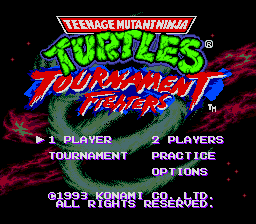 Teenage Mutant Ninja Turtles: Tournament Fighters (Ｔ.Ｍ.Ｎ.Ｔ. トーナメントファイターズ), known as Teenage Mutant Hero Turtles: Tournament Fighters in Europe, is a 1993 fighting game developed and published by Konami. It is a fighting game based on the Teenage Mutant Ninja Turtles multimedia franchise, featuring characters from the comics, cartoons and toyline. It was one of three fighting games released by Konami under the same title, the other two versions being for the NES and Super NES. The game plays like a standard Street Fighter II' inspired game. jumps and pressing away from an opponent will block oncoming attacks. Unlike most Street Fighter II' inspired fighters, only three buttons are used; punch, kick, and taunt. Stronger punches or kicks are triggered by holding the directional pad towards the opponent while pressing the button. Combinations of buttons can be used to unleash special moves. Desperation moves are available and do massive damage but can only be used when the life bar is flashing. Some levels feature destructible scenery which grants access to new areas of the level when destroyed. A similar feature was incorporated in Mortal Kombat 3 and it's later versions. Most characters are featured in the comics, however Sisyphus is an original character that never appeared in the series before this game. Main article: Teenage Mutant Ninja Turtles: Tournament Fighters/Magazine articles. Main article: Teenage Mutant Ninja Turtles: Tournament Fighters/Promotional material.